Poultry Selection in Gravy is rated 1.0 out of 5 by 1. Rated 1 out of 5 by Kitty Luva from Disappointing product Recently bought 2 boxes of Sheba Craft for my cat who likes gravy/sauce cat foods. - the poultry selection and the meat selection. They definitely look the part and resemble pieces of real meat in gravy/sauce but my cat would not even try it after giving it a brief sniff. When I smelt it, I could see why he didn't want to eat it. Weird, bland and virtually no meaty smell at all. Then I see on the Sheba website, that it's only 22% meat. Sheba products usually have a higher meat content so I was shocked and disappointed to see that - cats are carnivores afterall. 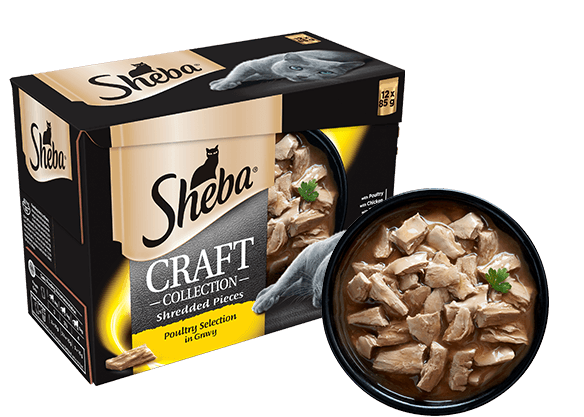 Not sure why they're called Sheba Craft - unless it's referring to crafting a product that looks like meat, out of vegetable protein and cereals. Even the stray cats outside will not touch this food, so I think Sheba need to improve the ingredients and make them more appropriate for a cat's diet.